The Z1000 Road Legal Buggy has a bigger, more powerful construction than some of the previous models. This ZForce 1000 road legal buggy completes the top of the range buggies from CFMoto. Equipped with a ferocious 963cc engine, this two-seater road legal buggy has many added features that will enable it to drive through any terrain with great control for exceptional performance. 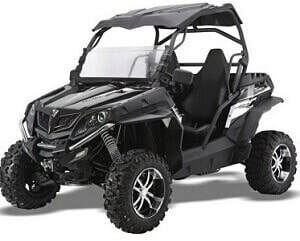 The 4x4 Quadzilla road legal buggy has a 2-year manufacturer's warranty subject to mileage limitation. High performance CVTech drive and driven clutch with engine brake. High intensity projector - beam headlights. Front and rear stainless-steel bumpers. CFMoto 14" black alloy wheels. Cargo and side nets. 3-point retractable seat belts with alarm light. Tilt steering wheel. Multi-functional digital dash. 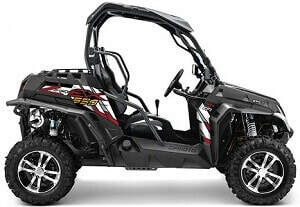 Engine: Latest generation 963cc-V Twin - 4 stroke - Liquid cooled. Bosh electronic fuel injection. Start system: Electric. Transmission CVTech automatic drive. Gears: High. Low. Neutral. Reverse. Park. Brakes: Front and rear hydraulic performance disc brakes. Suspension: Rear independent double A arms. Shocks: High pressure nitrogen shocks with compression and rebound adjustment. Curb Weight: 558 kg. Dimensions: L3140/W1510/H1845 mm. Minimum ground clearance: 300 mm. CategoryT1b homologation. The Z8 road legal buggy is an exciting, thrilling machine for the great outdoors. 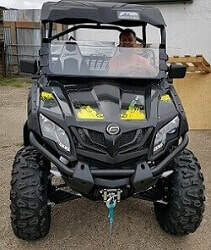 This road legal top of the line, all round adult sports buggy, offers premium features as standard, affordable price and 1-year parts and labour warranty. With exceptional acceleration and precision that can get you from 0 to 60 km in 3.21 seconds, this powerful road legal sports buggy is also equipped with gas shock absorbers to provide a smooth journey on the roughest terrains, without compromising comfort. 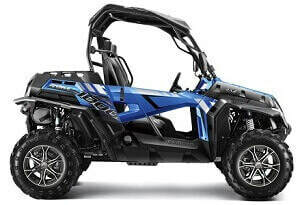 The Quadzilla Z8 road legal buggy switches between 2 and 4WD at the push of a button and its electronic fuel injection V-twin engine delivers a crisp responsive drive on and off-road. Fully road legal as standard. Selectable 2/4WD with on-demand diff lock. Powerful electric winch. Rear cargo bed 260 Kg. Electronic power steering. 14” black alloy wheels. High intensity projector beam. Headlights with LED running lights. Optional roof and screen. Full cab kit with heater available. Side and cargo nets. Multi-function LCD dashboard. Engine: Latest generation 800cc-V Twin-EFI-Liquid cooled. Start system: Electric. Transmission: CVT automatic. Suspension: High clearance front and rear independent double A arm with adjustable upper ball joints. Shocks: 205 mm travel piggyback shocks with compression, rebound and preload adjustment. Fuel capacity: 27 litres. Tow capacity: 500 kg. Dimensions: L 2870/W 1510/H 1830 mm. Minimum ground clearance: 310 mm. 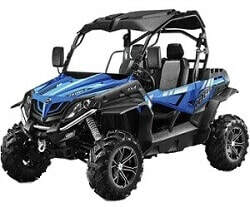 Recently improved and updated from the previous Z550 road legal buggy, the new 4x4 buggy Z550EX is now for sale. 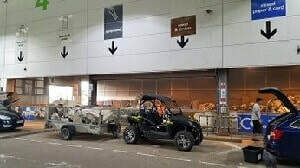 This top quality road legal buggy offers reliability at an affordable price and will gives a perfect ride and performance over a whole range of terrains. Powerful electric front winch.​ Rear cargo bed 260 Kg. Electronic power steering.​ 14” alloy wheels. Optional roof and screen (shown). Side and cargo nets. Engine: Latest generation 495cc - EFI-Liquid cooled. Suspension: High clearance front and rear independent double A arm. Fuel capacity: 27 litres. Tow capacity 460 kg. (See the new road legal buggy model version above). Made to an excellent standard, this CF Moto road legal buggy is a leading high quality motor vehicle with adjustable sports seats for maximum comfort. 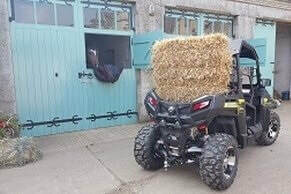 This adult road legal buggy from Quadzilla has been designed and built to offer impressive performance and durability and can be used for off road fun, as well as being a fully road legal sports buggy. Our competitive road legal buggy reaches high speeds quickly and gives a perfect ride, even on the harshest of trails. 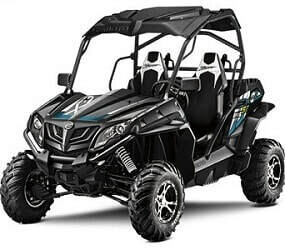 This buggy is the ideal legal sports vehicle for high endurance rides and difficult terrains, making it exceptional for leisure and working tasks. Selectable 2/4 WD with on demand DIFF lock. Electronic power steering. Electronic fuel injection. Four wheel independent adjustable suspension. Lightweight design for increased fuel economy. Roof and front screen as standard. Multi function LCD dashboard. Adjustable sports seats. 14" alloy wheels. Powerful electric front winch. Rear cargo bed 260 Kg capacity. Headlights with LED running lights. Engine: Single cylinder 4 Valve - SOHC - EFI. Cooling: Liquid cooled. Displacement: 495cc. Transmission: CVT automatic. Gears: High. Low. Neutral. Reverse. Park. Suspension: High clearance front and rear independent 'double A' arm. Dimensions: L 2870 mm x W 1510 mm x H 1830 mm. Wheel base: 2040 mm. Seat height: 395 mm. Minimum ground clearance: 310 mm.